Pretzels covered in a sweet and creamy yogurt coating, then topped with peppermint candy pieces. This seasonal item has a sweet and salty crunch. 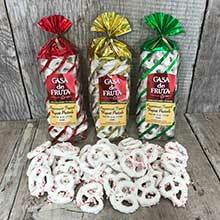 5 ounces packaged in a gold, green, or red striped bag.